Help! Do I need a left or right handed bow? Do you know whether you need a left or right handed bow? Do you even know the differences between a left or right handed bow and what they look like? In order to choose whether you should shoot a right or left handed bow firstly you need to know which is your dominant eye if you don’t already know this, follow our guide! There are a small number of people who can do everything just as easily with both hands, these people are truly ambidextrous. Once you know your dominant eye and dominant hand you can determine which type of dominance you have. A left handed person with a dominant left eye is left dominant. ​If you are right handed and your dominant eye is the right eye you are right dominant. Left eye dominant and right handed people are cross-dominant (sometimes called cross-eye dominant). ​If you are right eye dominant and left handed you are also cross-dominant (sometimes called cross-eye dominant). An ambi-ocular person who is left handed has partial left dominance. 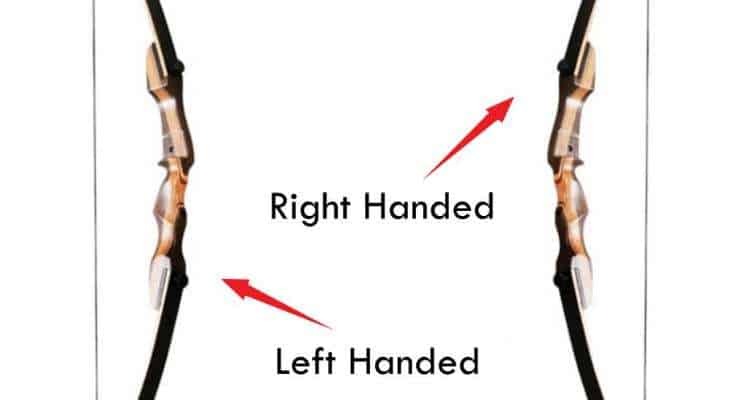 ​If you are ambi-ocular and right handed you are partial right dominance. ​If you are ambi-ocular and ambi-dextrous you’re pretty unique, it’s upto you to choose which you want to be your dominant side and which way you will shoot. Now you know your overall dominance, it will be easy to determine which type of bow you should shoot. People with a clear or partial dominant side should find the choice easy as it will be type of bow listed in the table above. If you are cross-dominant you have a choice to make and this can come down to personal preference or age. You will have to re-train either your eye or hand dominance when shooting, the older you get the harder it becomes to re-train your fine motor skills so the natural choice is to use the less dominant eye instead and choose the type of bow that matches your dominant hand. If you are young however you can entertain the possibility of shooting with your non-dominant hand, the best way to decide what feels best will be to visit an archery range and trial both ways of shooting. If you have no dominance, the choice is really down to personal preference, however here are a few things to bear in mind. A right handed bow is held in the left hand and the bowstring is drawn back with the right hand, conversely a left handed bow is held in the right hand the bowstring is drawn back with the left hand. Bows are manufactured differently for right vs left handed people however many other pieces of equipment such as guards, quivers and releases can be used with either hand. There are less left handed people in the world than right handed, consequently there is less archery equipment produced and stocked for them throughout the world. Although all manufacturers produce models of bow for both left and right handed people a right handed archer will find it easier to purchase and trial display models from shop stock and also find it easier to source items on second hand sites such as Ebay. Also when shooting at a range, the chances are that if you want to try someone elses bow they’ll be right handed however it is possible to…. Can I Shoot a Left Handed Bow Right Handed? This also applies to shooting a right handed bow left handed, and the answer is yes you can do it and you may be accurate, but the arrow rest will be on the wrong side and you will have to compensate for this in your aim so it isn’t advised that you do this regularly. Get the right sort of bow for your handedness unless you have no choice. Examine the area just above the grip on the handle of the bow the arrow rest should be there, as you hold the bow (with either hand) by the grip out in front of you the arrow rest will be on the left side of the bow for a right-handed bow and the right side of the bow for a left-handed bow. Now I’m more confused, the article says a left handed bow is held in the right hand and a right handed bow is held in left hand…. the picture seems Roy show the opposite…or am I just confusing myself? Yep, I think so! The hand you use to draw the string is the handedness of the bow. Held in left hand, drawn with right hand = right handed bow and on a right handed bow the arrow rest is on the left side (the side closest to you). Hope that helps! Hold the bow and look where the arrow rest is. If you are holding the bow with your right hand and the rest is in the same side as your thumb, then you are holding a right hand bow. To use this, you need to hold it by you left hand and hold the string with the right. The rest will be on your back hand side. This way if you hold the bow horizontally in front of you, the arrow will rest above the bow. The left hand bow would be the opposite.